Gunner's Mate 2nd Class Danny Phillip Dietz Jr. (January 26, 1980 – June 28, 2005) of Littleton, Colorado was a U.S. Navy SEAL who was posthumously awarded the United States' second highest citation for valor, the Navy Cross, on September 13, 2006. Danny Dietz Jr. was born on January 26, 1980 in Aurora, Colorado, the son of Danny Phillip Sr. and Cindy Dietz, and brother to Tiffany Bitz and Eric Dietz. He was a 1999 graduate of Heritage High School. He earned his black belt in Taekwondo from the Korean Academy of Taekwondo. Dietz enlisted in the Navy on August 31, 1999. Following his graduating from Recruit Training Command, Naval Station Great Lakes, on November 27, 1999, he completed Gunner's Mate "A" School at the Naval Air Technical Training Center in Pensacola, Florida. From there he transferred to Basic Underwater Demolition/SEAL training and graduated with Class 232 in 2001. Dietz went on to attend the Basic Airborne Course at Fort Benning in Georgia, then SEAL Qualification Training and SEAL Delivery Vehicle Training. Immediately upon checking in at SEAL Delivery Vehicle Team 2 in Virginia Beach, Virginia, on November 8, 2001, he was assigned to Task Unit Bravo as the secondary SDV pilot and the Ordnance and Engineering Department head. In Virginia Beach, Dietz met and married his wife, Maria L. Dietz, in March 2003. 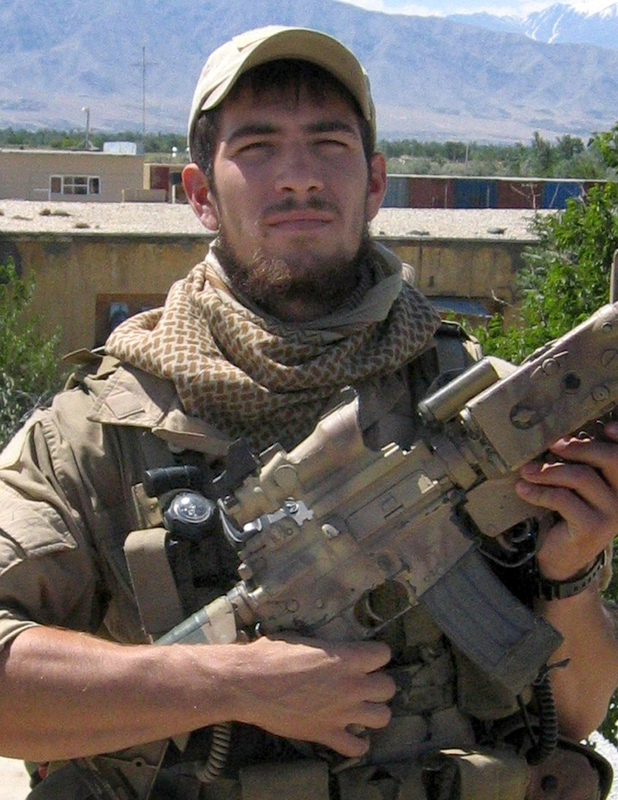 In April 2005, Dietz deployed with his Special Reconnaissance element to Afghanistan to support Naval Special Warfare Squadron TEN in the prosecution of the Global War on Terrorism. His larger than lifesize bronze memorial was created by sculptor Robert Henderson of Canon City, Colorado. The South Wing of the Pacific Beacon Apartments at Naval Station San Diego is named Dietz Hall as well. Dietz was part of an elite team of four SEALs on a reconnaissance mission "tasked with finding a key Taliban leader in mountainous terrain near Asadabad, Afghanistan," according to a Navy news release. "They were spotted by anti-Coalition sympathizers, who immediately reported their position to Taliban fighters. A fierce gun-battle ensued between the four SEALs and a much larger enemy force with superior tactical position," the Navy release said. The SEALs radioed for help, and a responding Chinook helicopter was shot down by a rocket-propelled grenade, killing eight more SEALs and eight Army NightStalkers. It was the second worst single combat loss for the SEALs in SEAL history. The location of Dietz's body was unknown for seven days. His remains were recovered during a combat search and rescue operation on July 4, 2005. Dietz was returned to the United States, where he was interred with full military honors. His hometown of Littleton, Colorado honored his memory by erecting a statue of Dietz in uniform holding his rifle, which was unveiled on July 4, 2007. This was not without controversy however. Local parents, suggesting that the statue of Dietz glorified violence, tried to have the statue altered. The statue, they argued, was three blocks from a school. The Littleton city council stated that 150 emails and letters were received in support of keeping the memoral as is, there was only one in favor of changing it. http://www.washingtontimes.com/news/2007/apr/6/20070406-115248-9955r/print/ After an even larger backlash against the parents group, the monument was erected with Dietz holding his service weapon as intended. A section of Santa Fe Drive (US Highway 85) between I-25 and C470 has been named the "Navy Seal Danny Phillip Dietz, Jr. Memorial Highway." ↑ Applies to all awards listed in the table. ↑ "Navy SEAL Honored with Hometown Statue Dedication". United States Central Command. Archived from the original on 2007-10-08. http://web.archive.org/web/20071008040233/http://www.centcom.mil/sites/uscentcom2/Service+Members+Stories/Navy+SEAL+Honored+with+Hometown+Statue+Dedication.aspx. Retrieved 2007-07-17. ↑ "Danny Dietz, Jr. Memorial Highway dedicated". 9News.com. http://www.9news.com/news/story.aspx?storyid=113096&catid=222. Retrieved 2011-05-08. ↑ "Danny Dietz Biography". Navyseals.com. http://www.navyseals.com/danny-p-dietz. Retrieved 2012-08-04. Sheeler, Jim (2006-09-02). "SEAL to receive posthumous honor". Rocky Mountain News. p. 1. http://www.rockymountainnews.com/drmn/local/article/0,1299,DRMN_15_4963718,00.html. "Danny Dietz". Find a Grave. http://www.findagrave.com/memorial/11305133. Retrieved 2009-05-11.